Notice anything weird about your News Feed today? 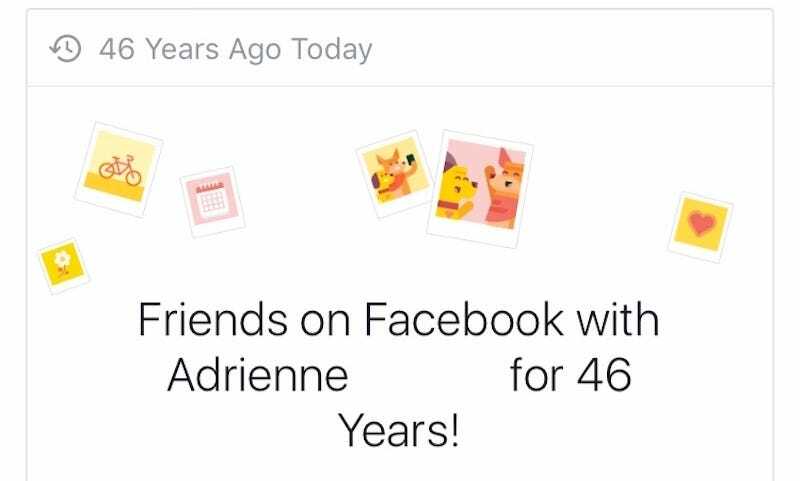 Scores of users are confused by typically smarmy “Friends on Facebook” messages that are celebrating 46 years of friendship. It appears to be a Unix glitch of colossal proportions. Don’t freak out. The world is not going to end because Facebook’s servers are confused about the New Year. In fact, as one developer points out, it’s most likely an issue with Unix time, also known as Epoch time. This system counts the number of seconds that have elapsed since January 1, 1970, so there’s a good chance that an error might’ve restarted the clock on this particular Facebook feature. (That’s almost exactly 46 years ago.) The glitch is not unlike the Y2K bug that hand-wringing sysadmins feared would crash computer systems around the world a decade and a half ago. …to those of you unaware, the Unix Epoch (aka the date that has an internal value of ‘0’ on a Unix system) is 1/1/1970, which based on time zone adjustments, can become a random hour on 12/31/1969. Which is 46 years ago today. Now, you might be wondering, so what? Why is it in my Facebok feed? Well, if you click on your “memories” page, you’ll see a subset of you friends listed as having a 46 year old Facebook memory today. Scrolling through my list, it’s the people I’ve been friends with on Facebook for a very long time - chances are, the “friends with since” feature was implemented AFTER I became friends with those people. And as such, it’s stored in the database as ‘0’ rather than the actual date. The developer who wrote the “friends with since” memories algorithm should have added a case ‘WHERE friendsWithSinceDate != ‘0” or something along those lines. But they didn’t so those people appear in today’s query. In fewer words, somebody screwed up. The explanation makes good sense, too. The person in the screenshot from my own Facebook page is someone I’ve been friends with since 2005, well before this feature existed. We’ve reached out to Facebook for more information about the oopsie and will update this post when we hear back. In the meantime, Happy Nerdy New Year, nerds!